It was the kind of day I dream about. My family and I went to our neighbors’ backyard to check on the food we’d helped plant there in May. The tomatoes were peppy, the flowers were vibrant, the basil was huge, and the pepper plants stood tall and proud. The sun, rain, seeds, and all of our hopes had come together to create a garden. 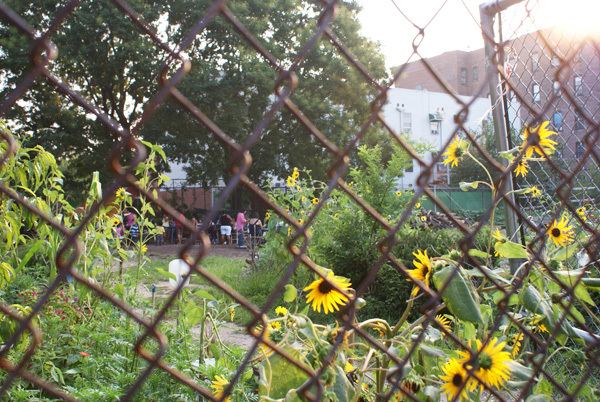 A lush, semi-unruly foodscape in the middle of the New York City concrete. It was just what I needed to see as we boarded the subway to go to the Bronx. I was headed to teach a workshop on creating herbal honeys at Brook Park. I would be reconnecting with youth who were taking part in the Padre Plaza Success Garden Summer Camp. I’d last seen the kids and their garden in June when I taught a class on some of the herbs at Padre Plaza. I also met Jada then, an amazing ten year old gardener who planted most of the herbs we’d be working with. Imagine my joy when upon return, I found that the youths’ adoration of the herbs had grown as much as the plants had. Click here to see Jada’s interview. Aresh Javadi, my friend and the inspired co-founder of More Gardens, and Kate Temple-West, a wise-woman, poet and gifted herbalist, brought huge jars of delicious honeys, lavender, sage, lemon balm, and wild mint. We then gathered some more fresh herbs from the garden. We returned to our gorgeous outdoor workshop space with armfulls of lemon balm, lettuce leaf basil, marigolds, mullein, and chocolate mint. It was time to make herbal honey! Why make herbal honey? Because honey alone is one of the most delicious medicines I know of. It is antibiotic, antibacterial, mineral rich and able to ease coughs better than commercial cough syrup in a single bound. It’s also great on scrapes, burns and cuts. Once you team honey up with an herb, you have a fantastically healing combination. Honey preserves many of the medicinal properties of herbs and you can add it to teas, spread it on bread, take it by the teaspoon, add it to elixirs or use it on your skin. I’ve done all of the above with herbal honeys and have a cabinet full of them to testify to their goodness. a chopstick or strong plant stems or a spoon. You rip the plant material into small pieces and pack the jar with it. Then you slowly cover the plant with honey. It is important to use the chopstick or the plant stem (we used those in our workshop and had great success) to push the plant material down after you have poured honey over it.We do this to release air bubbles in the medicine and ensure that the jar is full of honey and herbs instead of air! Once you have filled your jar with honey, cover it and put it away for six weeks. When you encounter your honey again it will taste like whatever herb you infused it with. I can’t describe how delectable this can be. You’ll probably forget it is supposed to be good for you. A few of my favorite herbal honeys are: sassafras (leaf and/or bark), lemon balm, lavender,rose hip,and sage. By the time our workshop was over, everyone was a happy, sticky mess. 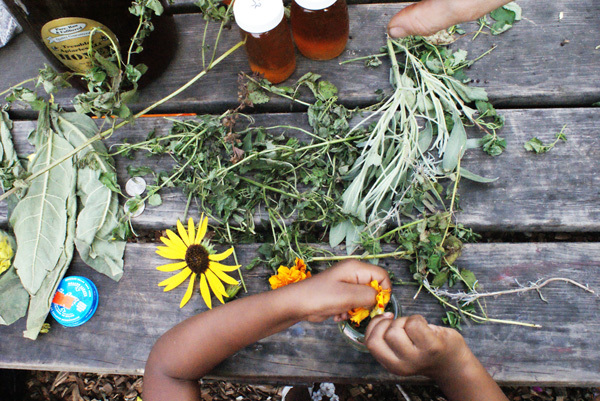 The beautiful jars of honey soaked herbs were cradled in the palms of the children. I left the Bronx elated: the future of healing is in wonderful hands. Wonderful and inspiring reading! I plan on making some of these herbal honies. Yay! Please let me know what you make and how it turns out. I love making these. I have studies herbs tintures for a while have spent much money on them. I am a herbalist myself and I had plan to make my own tintures. After researching how I wanted to make them. I decided to use raw honey and applecider vinegar organic. Thanks for more validation. I am using also skullcap an excellent sleep aid and nervine. Will make today. thanks for your interest this is my passion!!!! e-mail me on any information you have!!!! Thanks again. Joann from florida.